1. So, as the first step, you need to get your ExaGear Desktop. As soon as you are done with the purchase, you’ll receive an email with detailed tutorials on what to do. You need to have it in front of you when you are working with the Pi. Here I proved, one Japanese broker Rakuten FX. 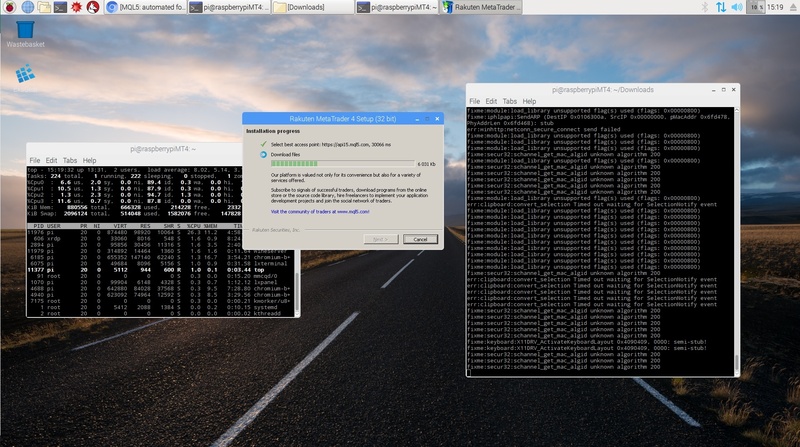 I’m running for 4 hours with no problems, free ram 49 mega, terminal is using ~300 mega. When Installig the metatrader4, it says “Unsupported operating system!”, what am I doin wrong? You need to install wine (emulator) first, then install MT4 via wine. When installing, Specify The Proxy popup shows. If you are in an intranet behind gateway,proxy setting is necessary. What are you settings if you got no real proxy but your router? Or did you install a sw-proxy locally? I don’t know exactly what the problem is but it seems to have something to do with the version of raspbian?! Jessy doesn’t boot and Stretch which has no problems with that doesn’t work with exagear and wine?! I found out how to use winetricks and installed winhttp which sometime solved problems und linux/x86…. But unfortunately this doesn’t work here. I found a solution this will work!